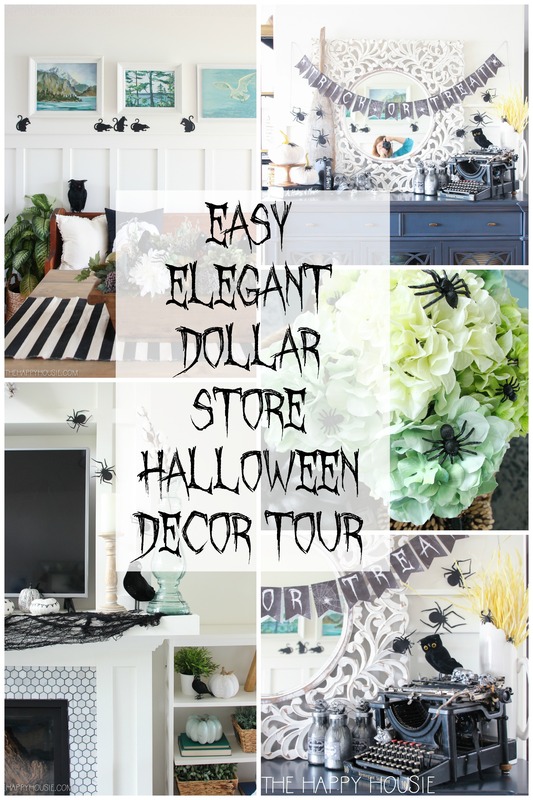 Today I’m sharing some easy but elegant dollar store Halloween decor ideas along with a mini Halloween home tour. 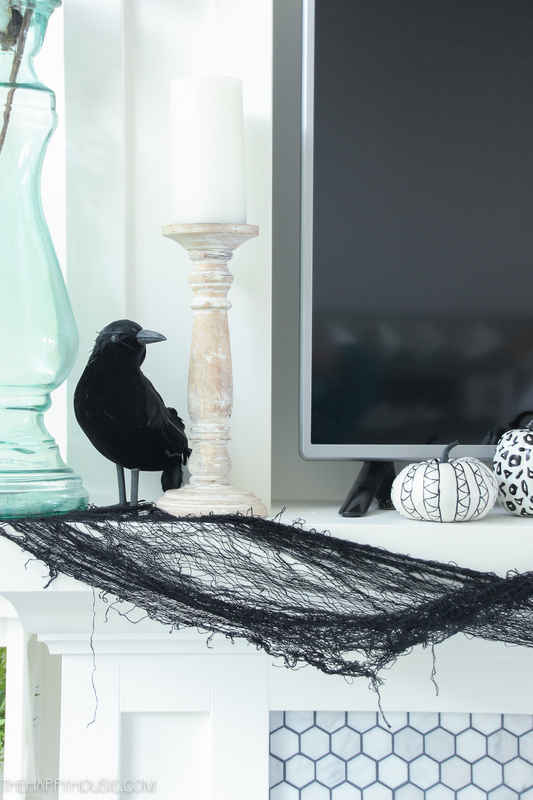 It’s been a couple of years since we did much in the way of Halloween decor around here. Truth be told, we live about 15 minutes out of town, and the houses are so spread out around here (or else sporadically occupied due to the number of “summer” owners), that we don’t even get a single trick-or-treater knocking at our door! 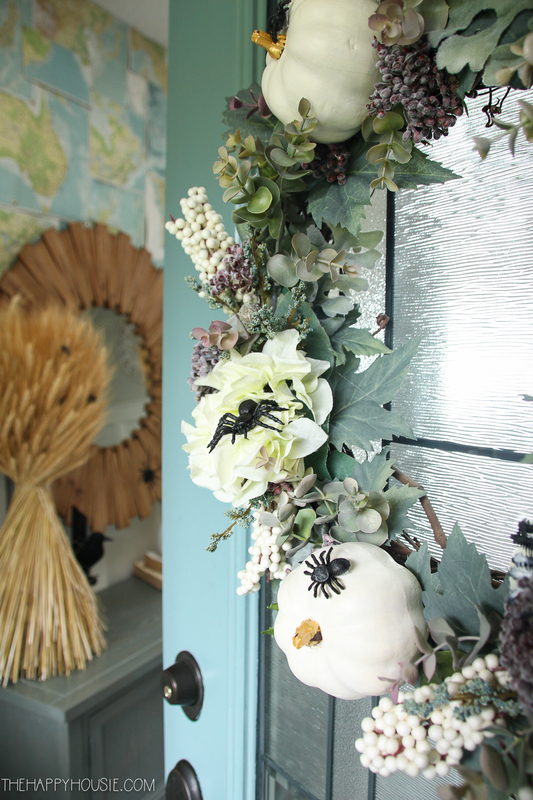 We head into town and usually trick-or-treat with some friends and around my parent’s neighbourhood, so we’ve never gotten into the habit of decorating outdoors for Halloween. BUT….my youngest really lovesHalloween. He bought this year’s costume during the last week of August (an Astronaut), and he’s worn it around the house almost everyday since. He’s even slept in it! (I guess Astronauts sleep in their space suits?!). So for his sake, I decided to bite the bullet and bring a little bit of his favourite holiday into our decor. 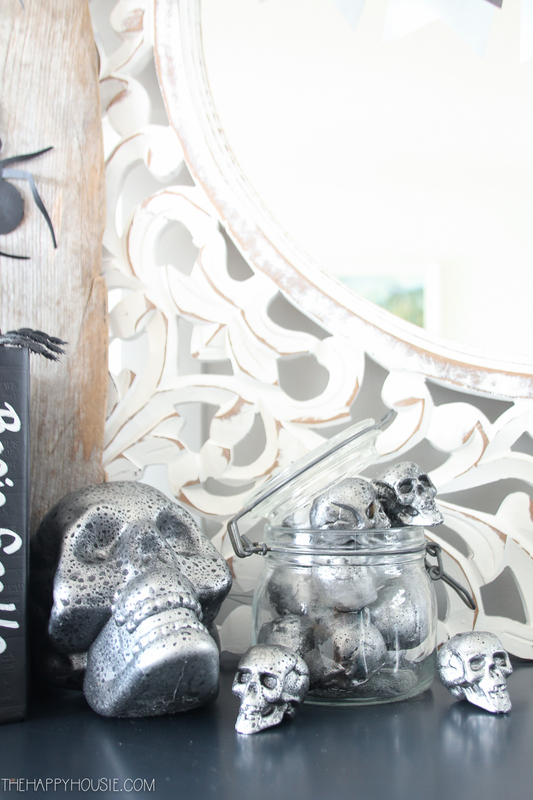 Using only dollar store and DIY items, I managed to infuse a little bit of an elegant Halloween feel in less then an hour. 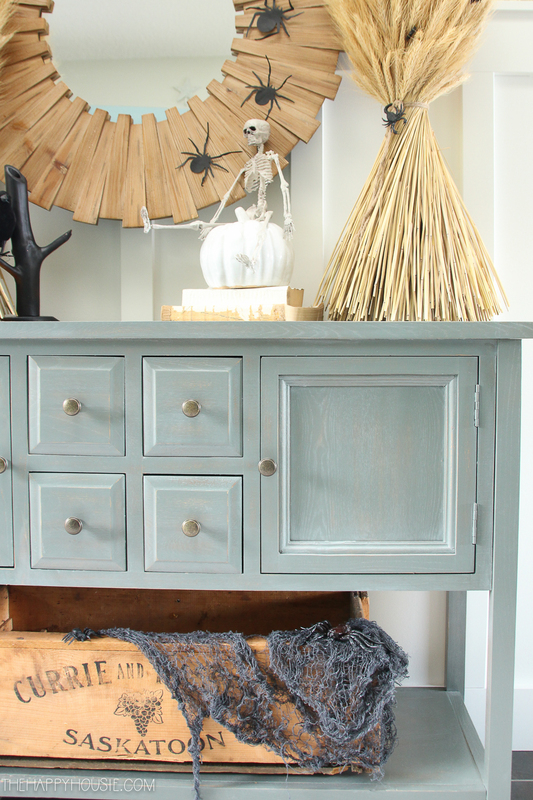 Thrifty and quick – two of my favourite things! 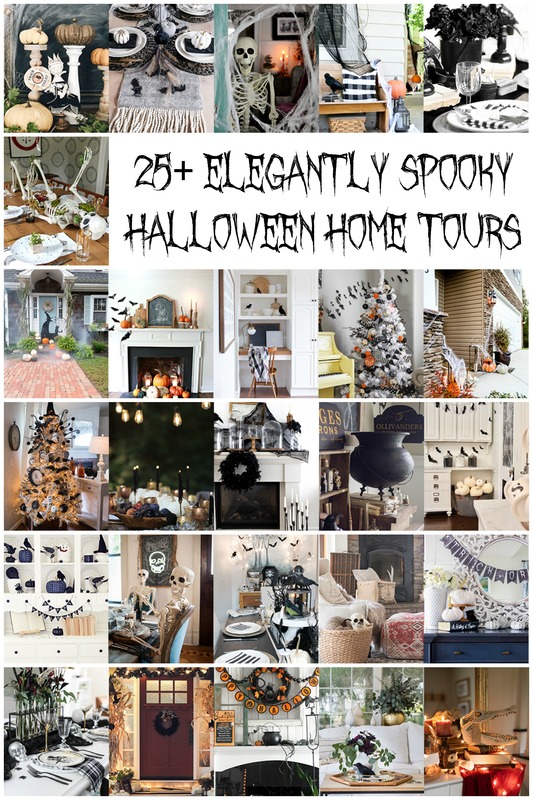 Today I’m honoured to be joining my talented friend Kristen from Ella Claire Inspired for a Halloween Home Tour hop. 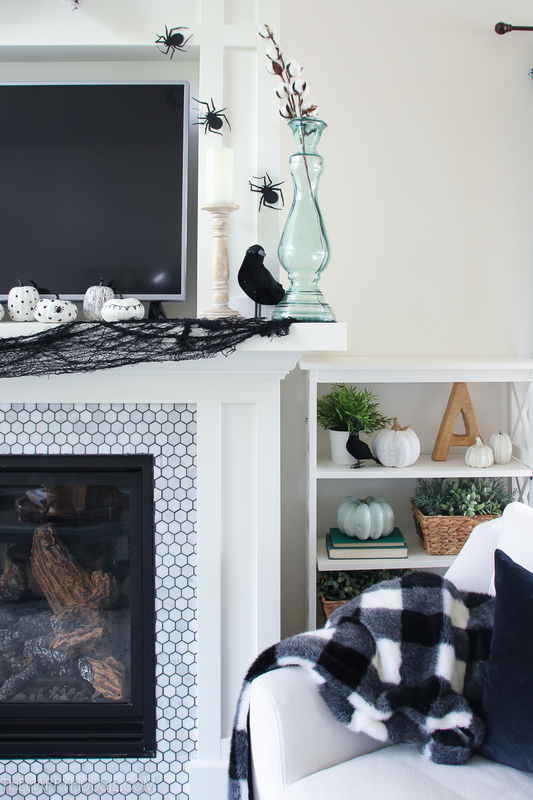 You can see who else is sharing some Halloween decor ideas today down at the bottom of this post! In fact, you’ll see that dollar store items are the key ingredient around here. Plastic spiders along with paper cutouts of spider and rats (also dollar store), as well as black crows galore (dollar store!). Rats, crows, and spiders are creepy enough for me… no need for any blood or guts. 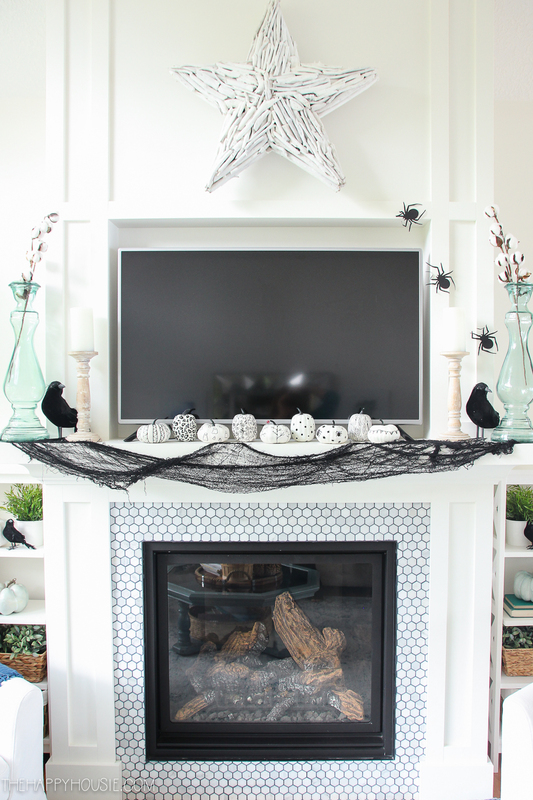 I added a few simple Halloween touches to the mantel, as well. Finn was pretty thrilled when he spotted those. He said “MOM! 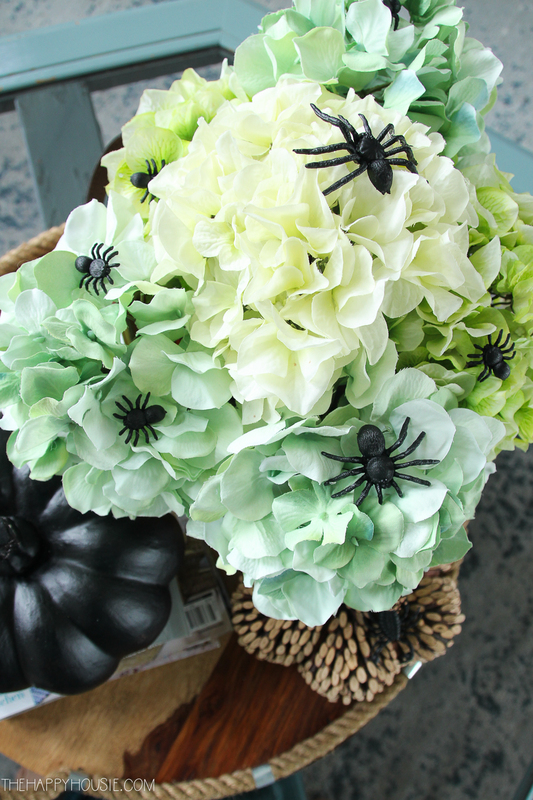 There are even spiders in your flowers!”. Why, yes, Finn, yes there are… (strong powers of observation, that one). 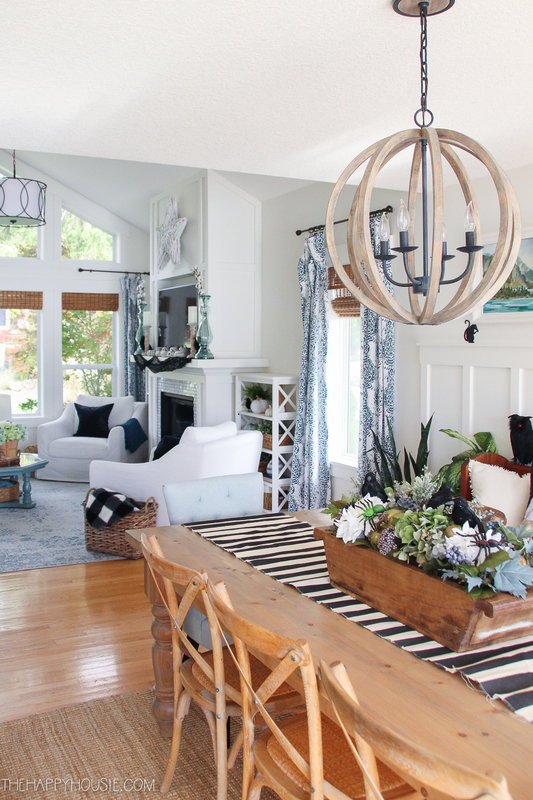 The dining room area got a similar treatment. 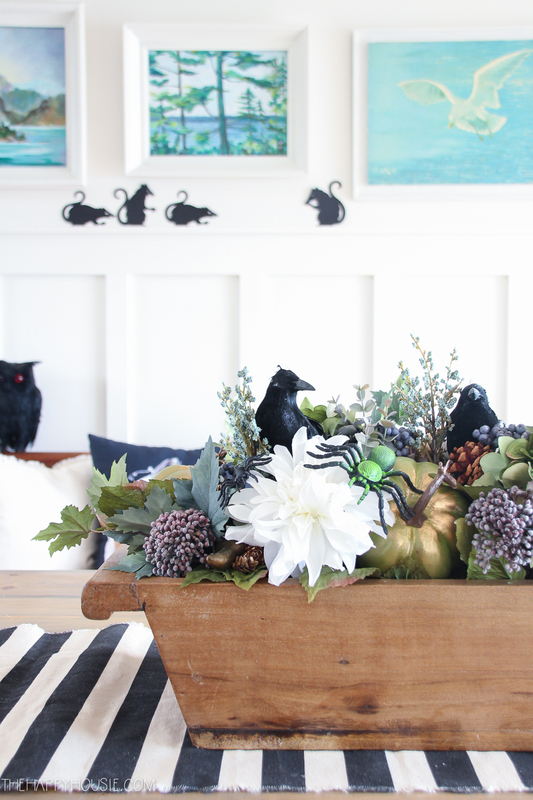 The runner is a DIY from a few years back… and the dough bowl centrepiece was dressed up with some crows and spiders. 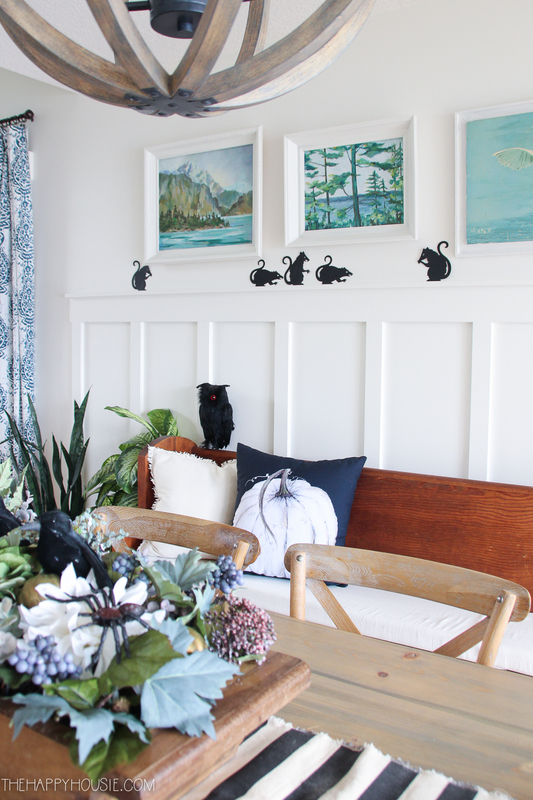 I also taped some rat cutouts to the top of the chair rail. EEK! RATS are the WORST and creepiest, in my book. 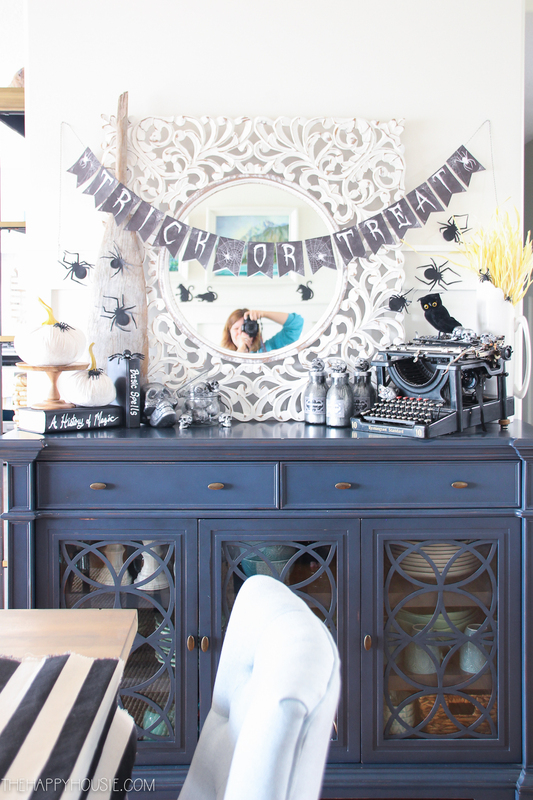 The other day I shared this free printable trick-or-treat banner, along with a Halloween vignette. 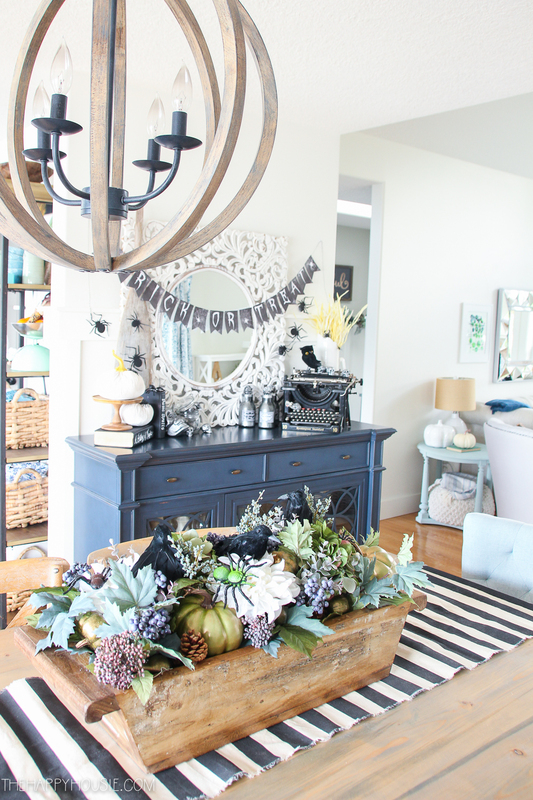 I tweaked the vignette a little when I added some more decor throughout the house, and wound up using some DIY pieces from previous years as well. The skull (large and mini!) 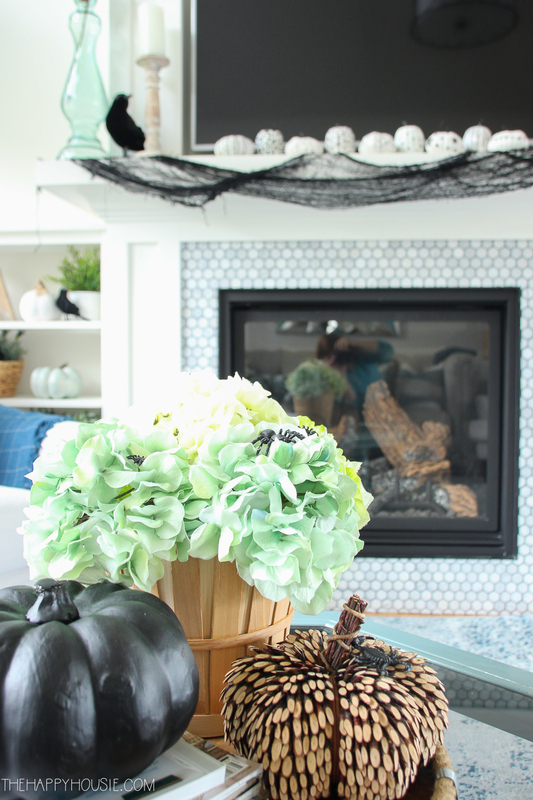 were cheap, ugly plastic dollar store finds that I transformed with some spray paint as a Pottery Barn knock-off project. You can read that tutorial here. 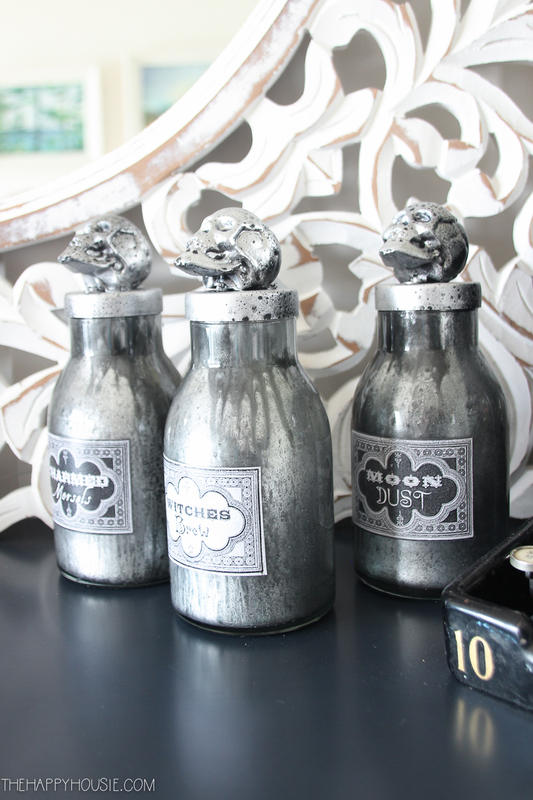 And the little spell bottles were another DIY that I’ll share soon! 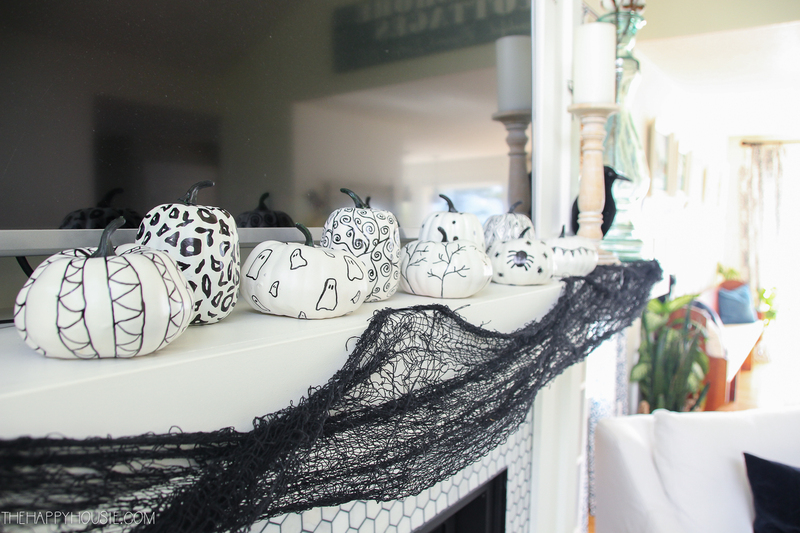 Not bad for only dollar store and DIYs, right? Want to remember all these fun tours? Pin it! Wow! Great finds and super cheap. They look way more expensive. I’ll have to try these out this Halloween. 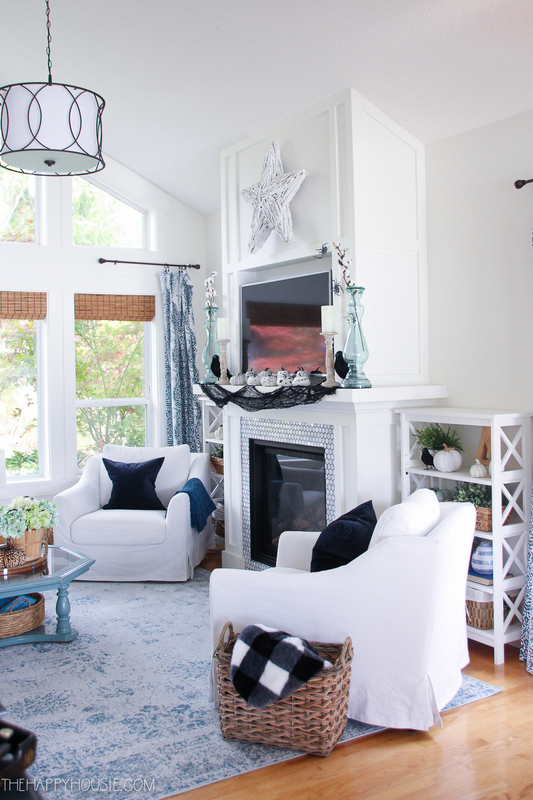 I love this idea and your home looks just adorable! Lovely decorations and great job. 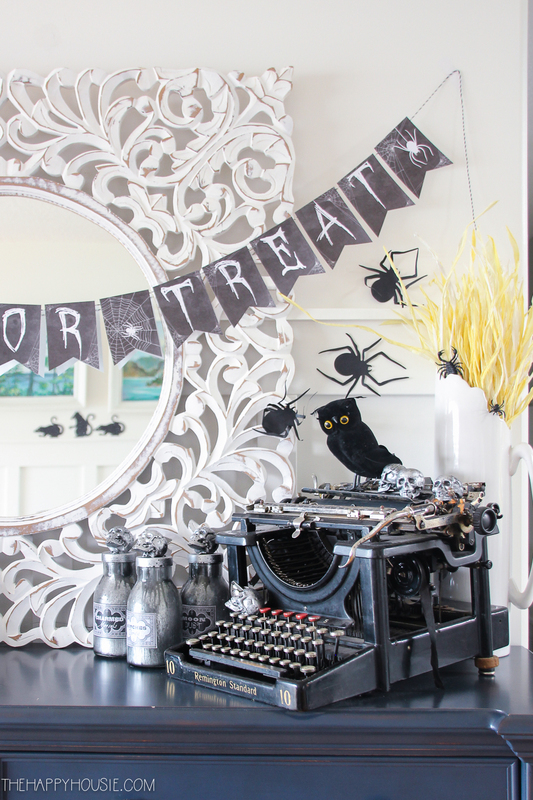 spooky and frugal too, love it! I invite you to share at my TFT link party. Hugs! 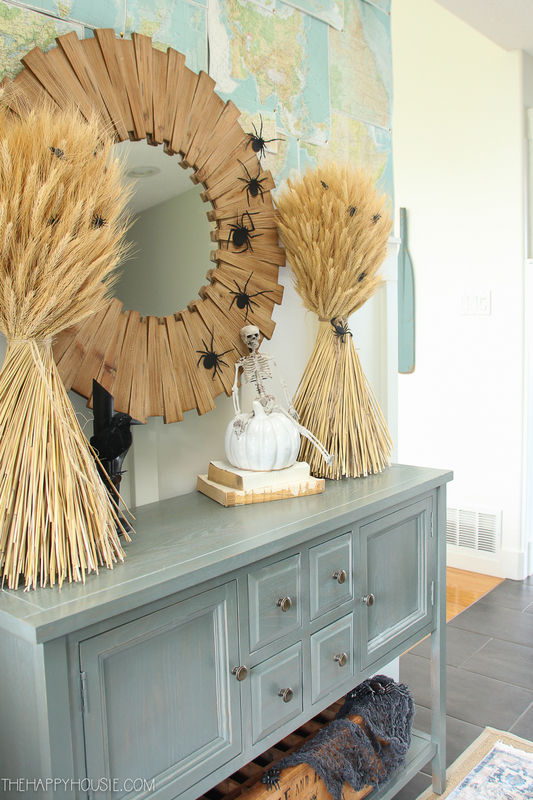 The additions of Halloween to your beautiful home decor look so wonderful! I love holiday decorations! I love all your dollar store finds! Isn’t it the best place for Halloween? 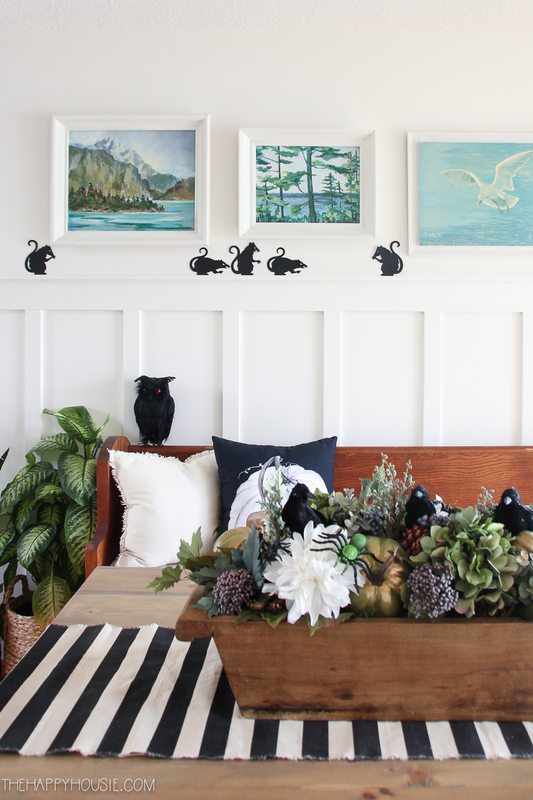 I pull my crows out every year! 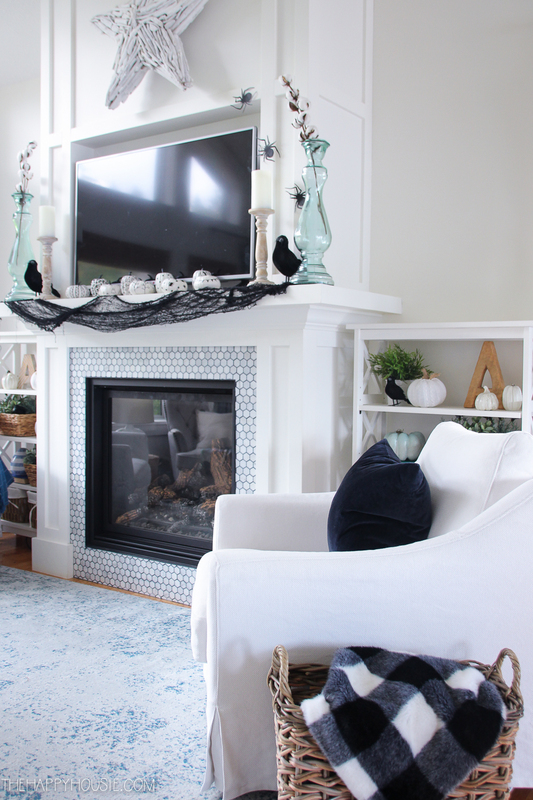 LOVE all your simple decorating ideas. Dollar Store for the Halloween win! 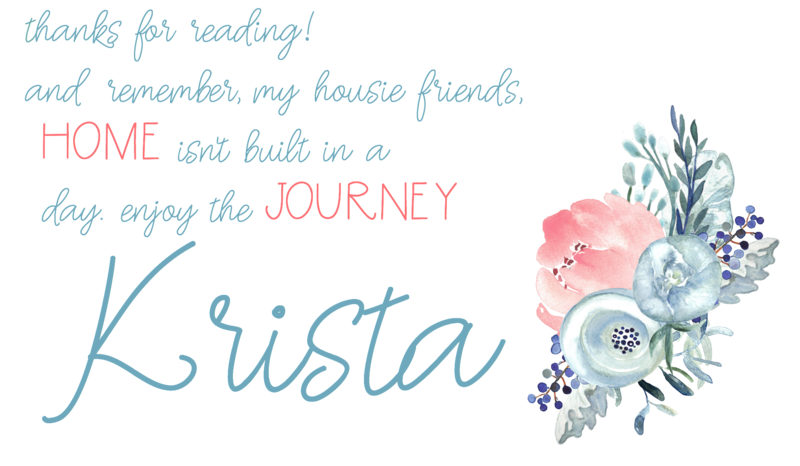 It looks so good, Krista! I’m sure your kids love it. I had no idea you didn’t get any trick-or-treaters. I guess that could be a good thing because someone always has to stay behind at our house to hand out the treats. 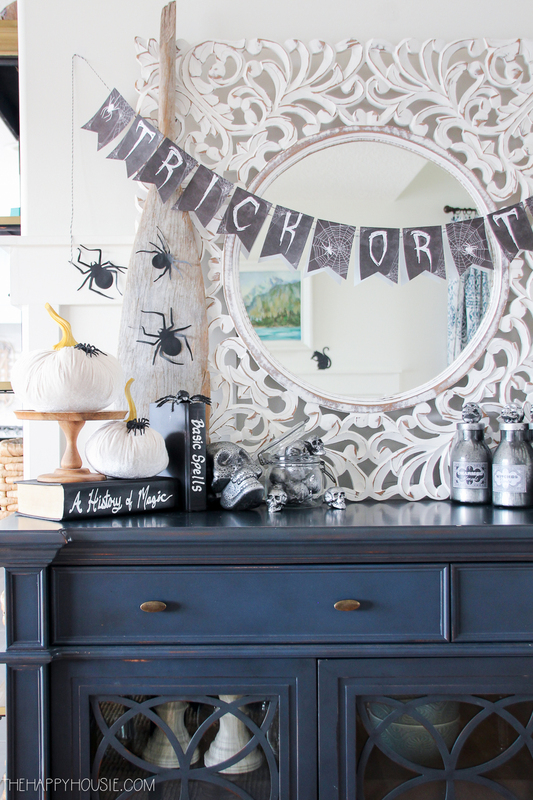 Yay for the dollar store and keeping everything spooktacular! Those halloween silhouettes are so much fun!! What creative ideas! 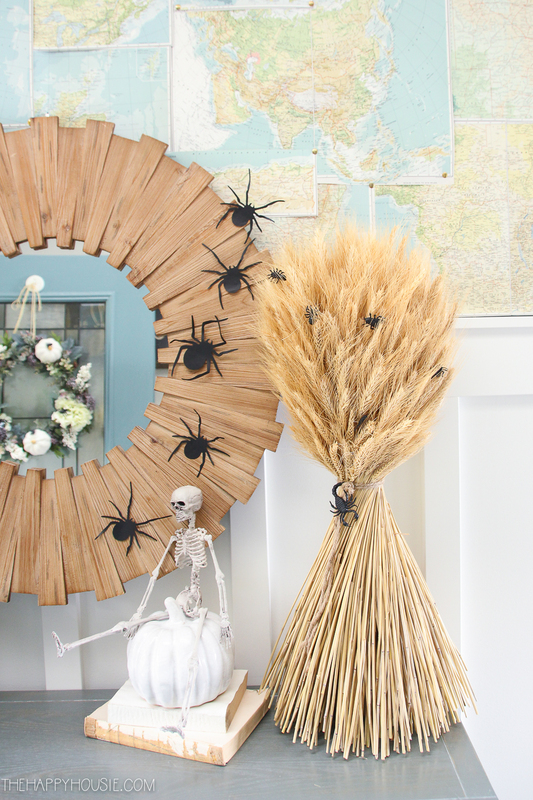 Such creative ideas with dollar store finds! I love it! 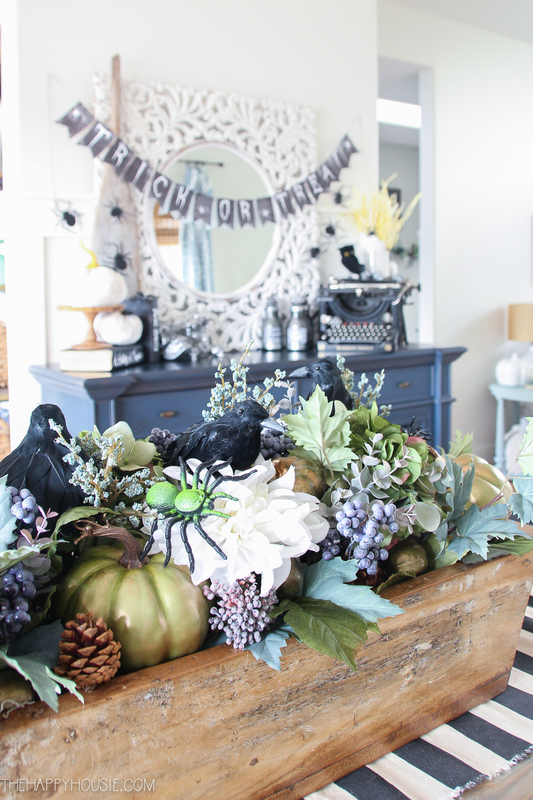 i love all of your halloween touches, krista! i love the spiders and mice the most! 🙂 this time of year is just my favorite.